Mixed media collage portraits are a great way to explore texture and use recycled materials. Project and post by Krista Simcoe of Riverside Art Studio. These mixed media collage portraits are a great lesson for exploring portraiture and texture with kids. We talked about portraits in class and how a portrait is a picture of a person. I referenced school portraits and selfies as a modern version of portraiture. You could also pull out whatever portrait examples you might have on hand. Pull them up on a computer or print them out ahead of time. I love showing the kids Paul Klee’s cubist portrait “Senecio” for this project. We also discussed the parts of the face, eyes, nose and mouth along with eyebrows, eyelashes, cheeks, ears, etc. The more details you add to these portraits the more character and individuality they will have. Start with a cardboard base of a square and a circle. I used some cardboard cake bases that I had leftover from another project, but you could easily use whatever cardboard you have lying around. Cut out a square and paint with white acrylic paint for the base. Then cut out a circle and glue to the square as a starting point. 2. Gather interesting materials with good texture. Think about the features you are trying to represent. 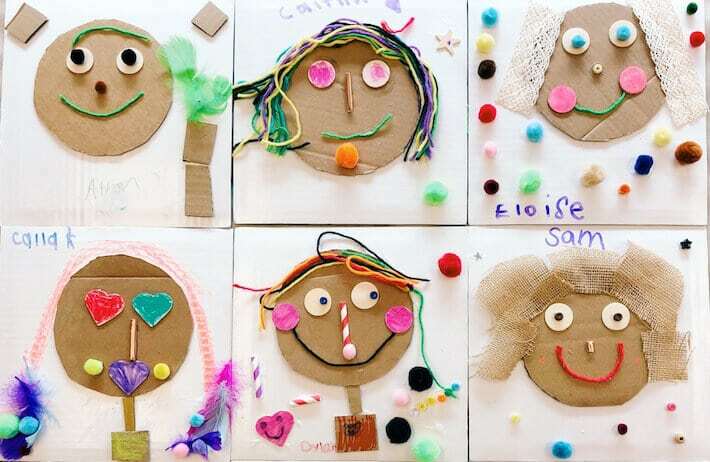 A cut up straw and pom pom for the nose, buttons for the eyes, yarn for the mouth, cut up toothpicks for the eyelashes, lace for the hair, cardboard squares and rectangles for the neck and shoulders. Don’t overthink it. Put out some objects that are interesting and let the kids surprise you with their creativity. They don’t need a ton of instruction with this project, just a base to start with and a lot of fun materials to choose from. 3. Put all the supplies out like a buffet of textural awesomeness. You can use separate containers or a tinker tray (I like to use a utensil organizer from Ikea) along with lots of glue. Usually I tell the kids a little dab will do it, but with these materials you need a big ol’ glob. Press those materials into the glue for a few seconds so they stick and keep a damp towel out for wiping sticky fingers. I put drawing supplies out last so the kids focus more on the texture supplies. These are just for finishing touches. I just adore how these portraits came out. Each one is so individual and I love how they show the personality of each little artists. These definitely need some time to dry so leave them out for at least an hour, but preferably overnight. Then you want to give them the “shake test”. I have all my students do this before they take a collage home. Pick up the piece and give it a gentle shake up and down. Secure any pieces that might have fallen off with an extra dab of glue or use a hot glue gun if necessary. I hope you enjoy creating these fun mixed media collage portraits for kids! 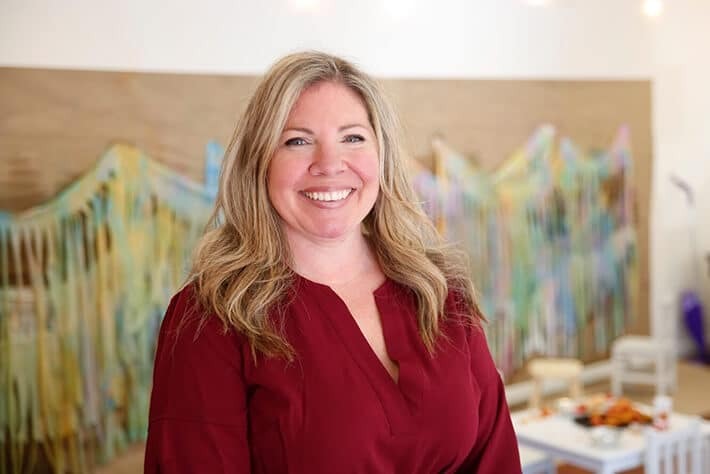 My name is Krista Simcoe, and I am the owner and instructor at Riverside Art Studio. I have a Bachelor’s Degree in Fine Art from Mason Gross School of the Arts at Rutgers University and a Masters in Art Education from Kean University. I am a certified art teacher in the state of New Jersey and was a public school art teacher for 15 years. Riverside Art Studio is the result of a longtime dream of mine to have a studio where kids, families and community can come together and have a true artistic experience. A place where kids are allowed to create without restrictions. 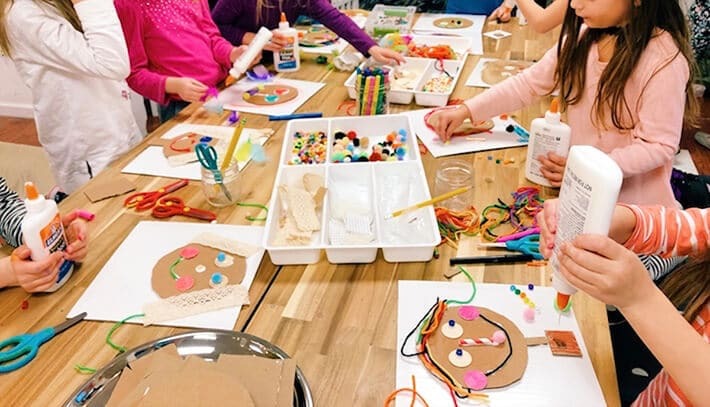 I wanted to provide a space for kids to enjoy the process of art-making and experiment with art materials and processes, igniting the creative spark and placing kids on the road to becoming makers and creators. Follow along with us on Facebook and Instagram.